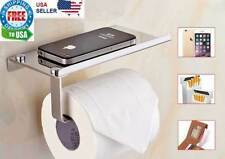 Elegant Toilet Paper holder. Holds 3 Rolls at the bottom and 1 Roll at the top or daily use. Maximum Roll width: 115MM. 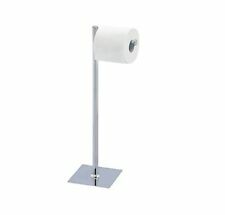 Free standing toilet roll holder. Square non slip base. They are made by machine but finished by hand for an authentic look and feel. Accessorise your bathroom in copper. 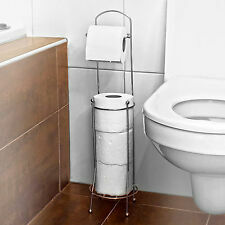 This toilet roll holder will add a retro industrial look to your bathroom and WC. 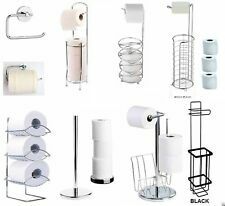 Great for creating an industrial look to your bathroom. Colour: Copper. not a parcel firm (they drop things a lot!). A FANTASTIC REPRODUCTION VICTORIAN TOILET ROLL HOLDER. CAST IRON INDUSTRIAL STYLE TOILET ROLL HOLDER This cast iron toilet paper holder will add heavy industrial charm to your bathroom. Made from solid cast iron with a rustic wooden removable holder. 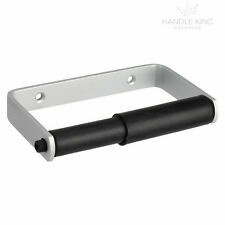 Easily remove the wooden holder to change roll by twisting the metal ends. Sold complete with fixing screws. Dimensions: Width (at widest point) 185mm | Height: 90mm | Fixing Centres: 83mm | Depth: 70mm PLEASE NOTE: This product might show signs of rust and will have a light coating. If you have any questions please call me on 01746 710 777 SHIPPING INFO EASY & FAST DELIVERY USING ROYAL MAIL RETURNS If you have any problem with this product then return if to us within 14 days and a full refund will be issued. CAST IRON VICTORIAN STYLE TOILET ROLL HOLDER This lovely ornate scroll cast toilet paper holder will add lovely victorian period charm to your bathroom. 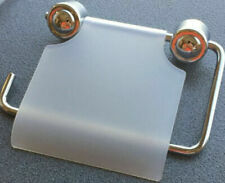 Made from solid metal with a removable metal bar. Easily remove the metal bar to change roll by pulling it from the right hand side. Sold complete with fixing screws. 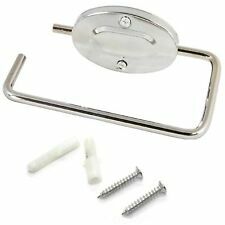 Dimensions: Width (at widest point) 185mm | Height: 55mm | Fixing Centres: 90mm (approx) | Depth: 115mm Fits a 115mm toilet roll. If you have any questions please call me on 01746 710 777 SHIPPING INFO EASY & FAST DELIVERY USING ROYAL MAIL RETURNS If you have any problem with this product then return if to us within 14 days and a full refund will be issued. 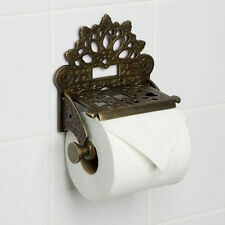 CAST IRON VICTORIAN STYLE TOILET ROLL HOLDER A stunning ornate Victorian Style Cast Iron Toilet Roll Holder. Made from an original antique style pattern. 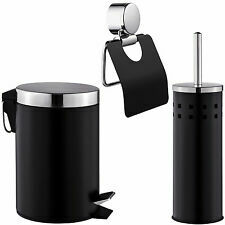 Easily remove the turned wooden holder to change rolls easily. A simple, classic design. 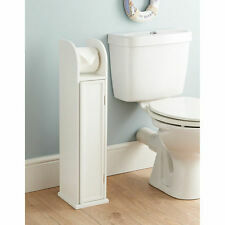 Looks item to add rustic, traditional, antique charm to your bathroom. 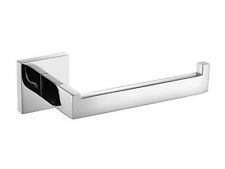 Measures: 195mm x 140mm If you have any questions please call me on 01746 710 777 SHIPPING INFO EASY & FAST DELIVERY USING ROYAL MAIL RETURNS If you have any problem with this product then return if to us within 14 days and a full refund will be issued. A FANTASTIC REPRODUCTION VICTORIAN TOILET ROLL HOLDER. Happy buying. CLEVER SHEEP DECOR - Make holding reserve toilet paper rolls cute with this Sheep Toilet Paper Holder. 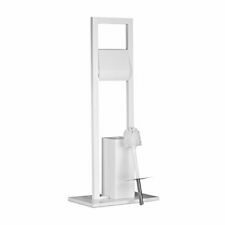 Stands upright or hangs on the wall. 21"w x 12"h; one TP roll deep. Simple assembly. STANDS UPRIGHT OR HANGS ON THE WALL - Looks great on your floor, or easily hang it out of the way on your wall. WUNDERSCHÖNER TOILETTENPAPIERHALTER IM ANTIK NOSTALGIE STIL. AUS GUSSEISEN GEFERTIGT UND DETAILREICH VERZIERT. 14cm BREIT 9cm TIEF UND 15cm HOCH. PASST FÜR HANDELSÜBLICHE PAPIERROLLEN. DURCH DIE HERAUSNEHMBARE HOLZSTANGE LASSEN SICH DIE ROLLEN LEICHT UND SCHNELL WECHSELN. You can use a shelf for flower pot, candle, any décor item or a phone. This holder will make a unique addition to any bathroom décor. #8 Style – Rustic Pine. BUT these characteristics make each holder truly unique and give unmatched charm. 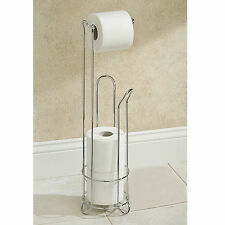 A FANTASTIC REPLICA TOILET ROLL HOLDER. MADE FROM SOLID BRASS WITH A SOLID TEAK BAR. Novelty Toilet paper holder... wooden frog loo roll holder .. Hand made by olio..
A FANTASTIC REPLICA EDWARDIAN TOILET ROLL HOLDER. MADE FROM SOLID BRASS WITH A SOLID TEAK BAR. Fluoride in tap water boil dry you can see. Buy Evian from France or Fiji from Japan but I like Evain tastes better. Check out Hillsong - Beneath The Waters (I Will Rise) its on Youtube. Copy Youtube link, paste in field box, hit convert video, download, save file, 5 seconds. Material: SUS304 stainless steel. Sucker: ABS. 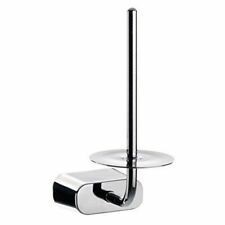 Size: 165 x 93 x 45 mm.Durable ABS resin bottom and SUS304 Stainless Steel provides long lasting quality.Saving space and keep paper in order, suitable for washroom and kitchen.Super strong suction power. Single one sucker can bear 6KG weight for about 1 year. This suction hook easily attaches onto compatible surfaces without using tools or glue. The red ring on the button gives reminder that the suction cup tends to fall off.Suction works on ceramic tile, glass, mirror, granite, stainless steel, acrylic, laminate and any non-porous surface with glossy finish.Suction does NOT work on marble, sanded tile, porcelain, stone, dry painted wall, wood and any surface that is porous,bumpy, coarse, textured or matte fin. WUNDERSCHÖNER TOILETTENPAPIERHALTER IM ANTIK NOSTALGIE STIL. AUS GUSSEISEN GEFERTIGT UND DETAILREICH VERZIERT. 14cm HOCH,17cm BREIT. DURCH DEN BÜGEL LASSEN SICH DIE ROLLEN EINFACH UND SCHNELL AUSWECHSELN. ↵ Free Shipping Ships Same Or Next Business edit. 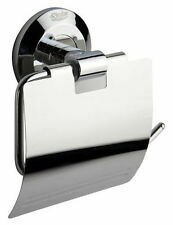 MOEN Paper Holder Villeta collection MOEN Paper Holder Villeta collection. ---Material: Chrome. ---P/N: YB3608CH. ---Easy to install. ---Mounting hardware and instructions are included.